We rent Tents, Tables, Chairs and party rental equipment in the Atlanta, Georgia area. One stop shop for your party rental needs. Tents and accessories allow you to select the perfect setting for your special occasions, business events, weddings and receptions. Put a tent in your garden, in the park, over a driveway or any other location that offers fresh air and outdoor fun. Select the tent size and style that best meets your needs- open and airy or with sidewalls or windows. You can even add a marquee tent to define the entrance and walkways to add style and weather protection. Sidewalls are great to add privacy, keep warmer air inside, and keep insects out. Sidewalls for the tents are additional. If you are having a wedding this summer now is the time to reserve. We only have a limited amount of each tent size. A good rule is to reserve at least 6-9 months ahead for your tent rental. We are already getting reservations for next year. You can always change the exact amount of tables, chairs, and tableware once you get your RSVP's back about a month before your important event. Your event is too important! When events demand a spectacular presence, the Elite tent's spacious interior and cathedral-like ceiling offer added glamour and style. 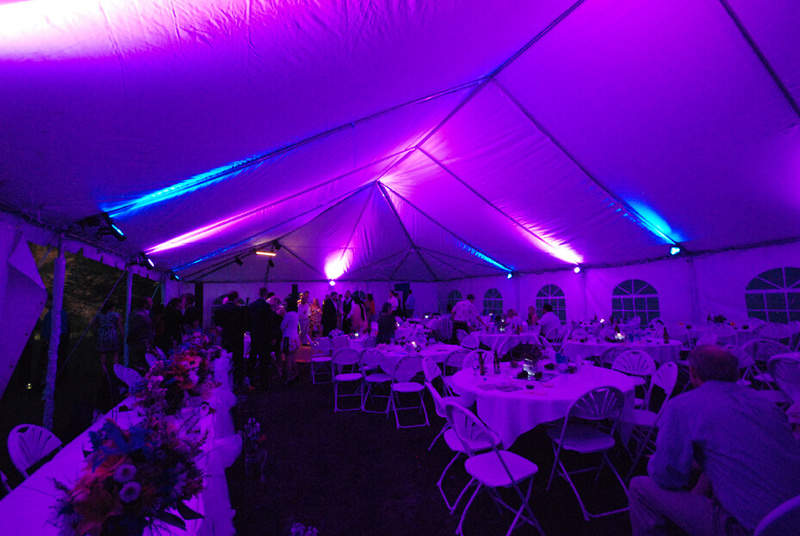 The elegant profile of an Elite tent rental provides the ultimate expression of style. Pictures are shown with optional leg curtains and sidewalls. A pole tent is a heavy duty party tent made of thick vinyl supported by poles around the perimeter and in the center. All pole tents are available with a choice of sidewalls styles as shown in the tent accessory page. A Frame tent is constructed with a metal frame that has no center poles. Frame tents offer infinite decorating and layout possibilities. The self-supporting structure is great for situations like decks, driveways, parking lots, lawns with sprinkler systems which can not accommodate tent stakes. Frame tents are designed to withstand rougher weather conditions, including wind. Marquee tents are great for "hallway" type shelters that define entrances and protect traffic from one tent to another tent or building. Pictures shown are with optional leg curtains or leg covers.